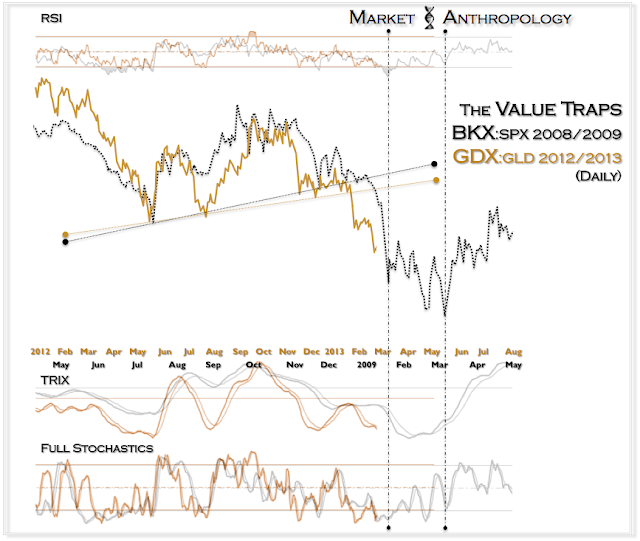 The long and short of things: The US dollar hollered - and the "silver" lining in equities gets paper thin. Continuing their declines, silver and the silver:gold ratio fell sharply (-3.76% and -1.84%, respectively) again last week. 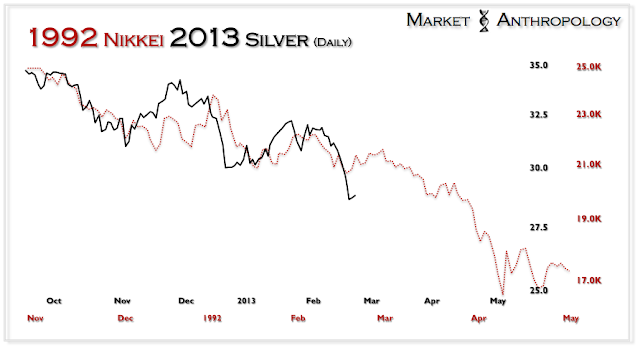 The silver:gold ratio's performance spread to the SPX (as measured from the start of the secular bear market in equities in March 2000) also contracted. 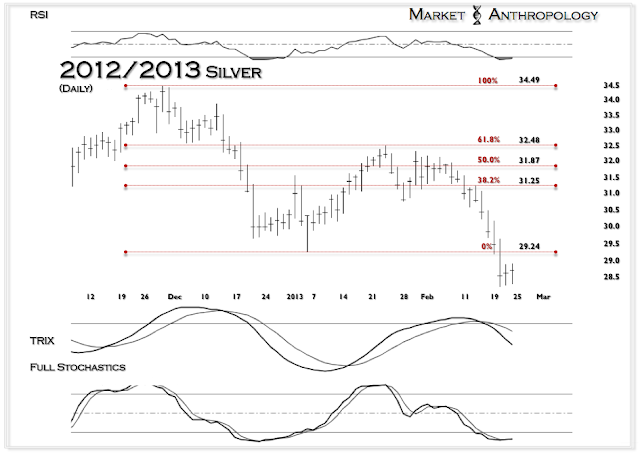 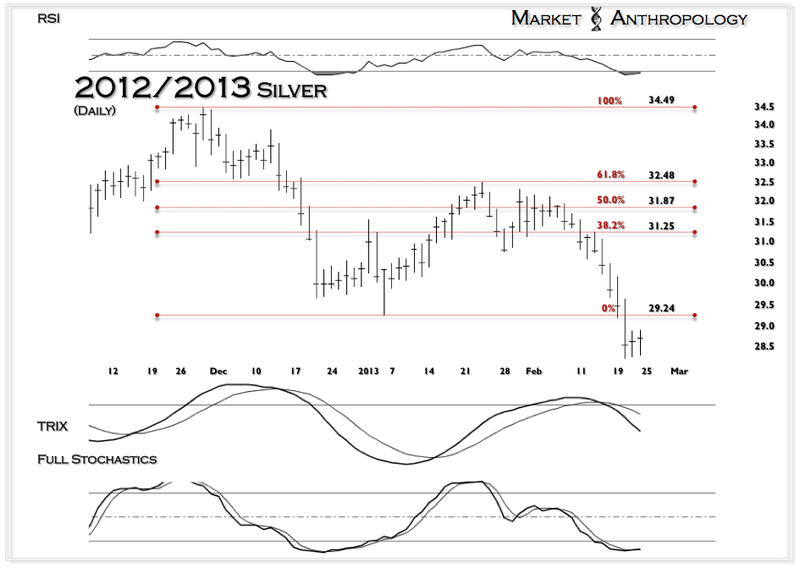 We continue to maintain a bearish perspective towards silver and the precious metals and expect the lows from 2012 to be broken in the first half of this year. After last week, the silver:gold ratio's performance spread to the SPX stands at 140 basis points. 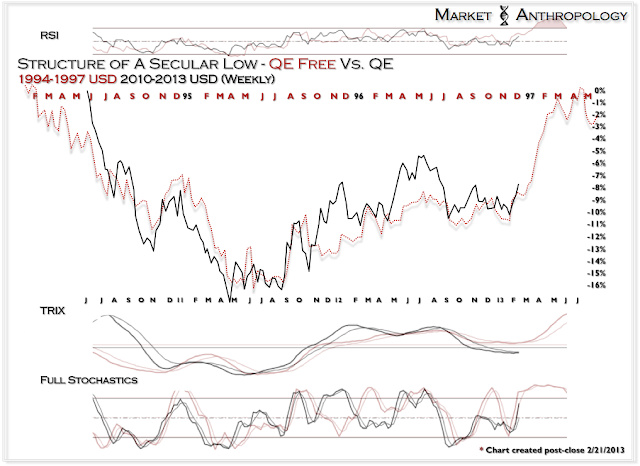 This is the narrowest spread for this reflationary measure of the equity market rally that began in March 2009. 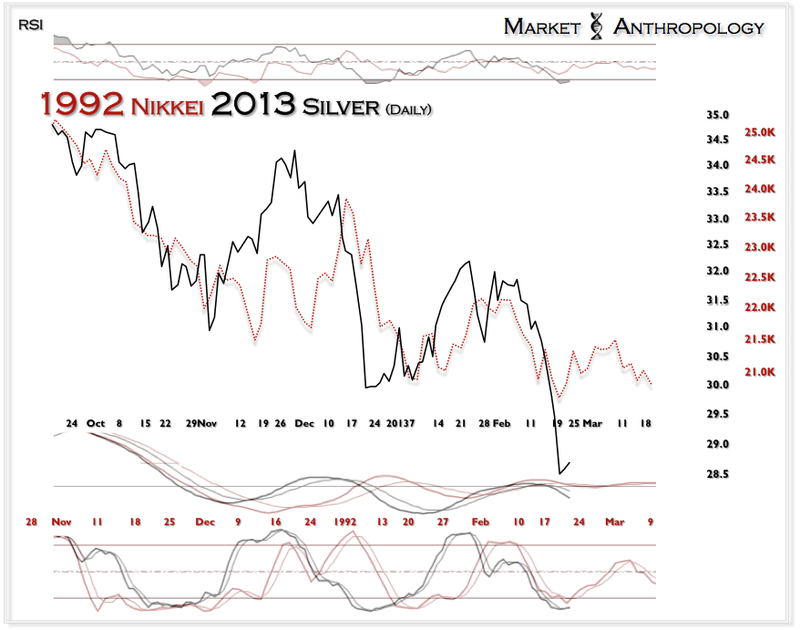 In the past (2000 & 2007), when the silver:gold ratio's performance has "inverted" below the SPX's, this has indicated the start of another cyclical leg lower in the equity markets. 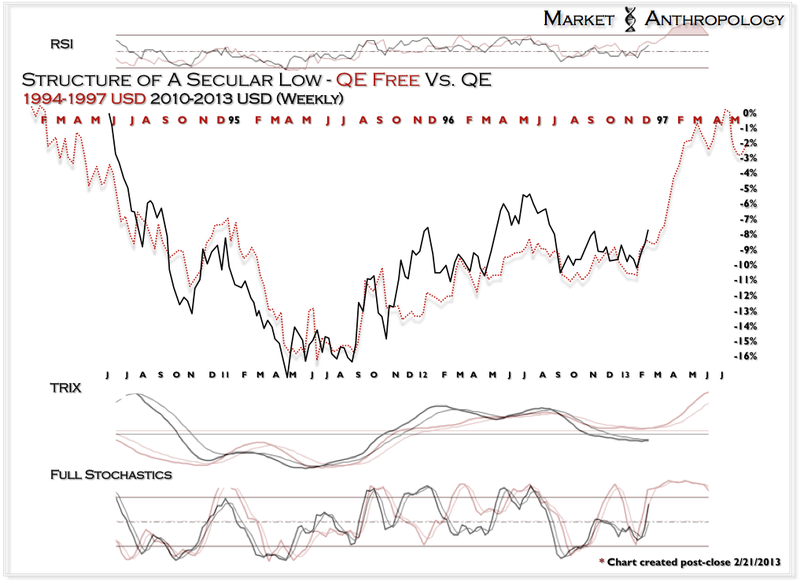 It is our expectation that this disinflationary construct will provide another performance inversion in the short term. Although a shallow retracement would not surprise us, risk remains firmly on the downside in silver - despite the most recent decline exceeding the expectations of the 1992 Nikkei comparative. 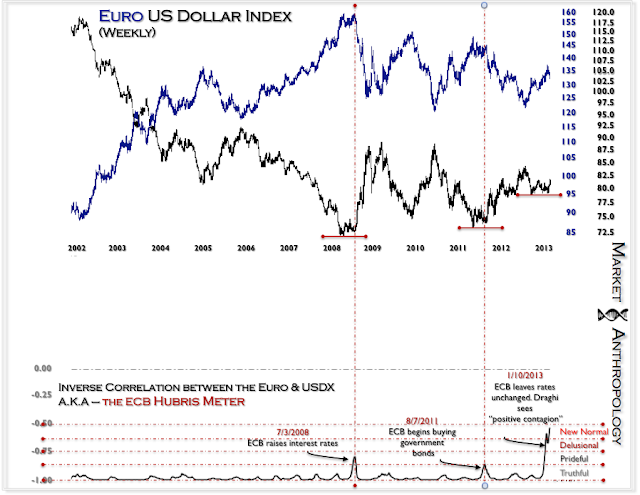 The atypical correlation drop in the euro/US dollar index extended and made a new all-time high last week - despite the continuation of the rally in the US dollar. 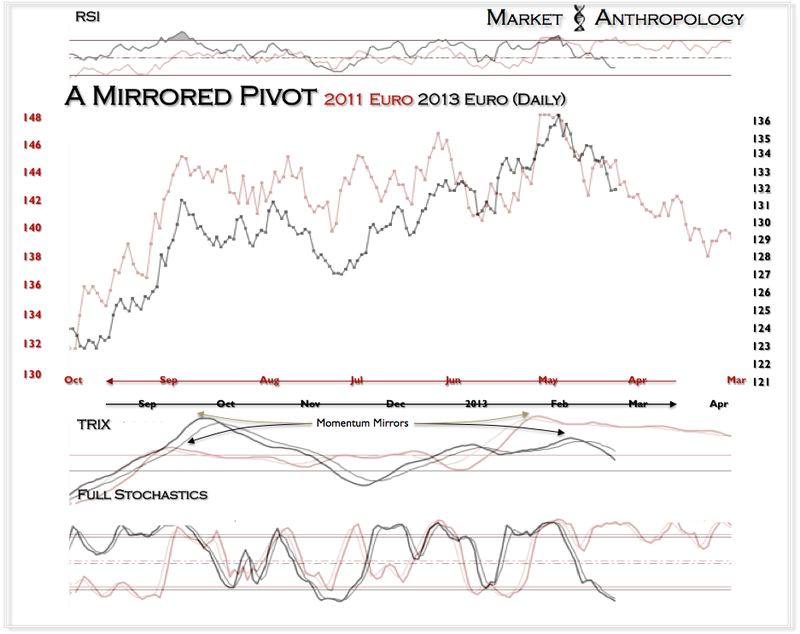 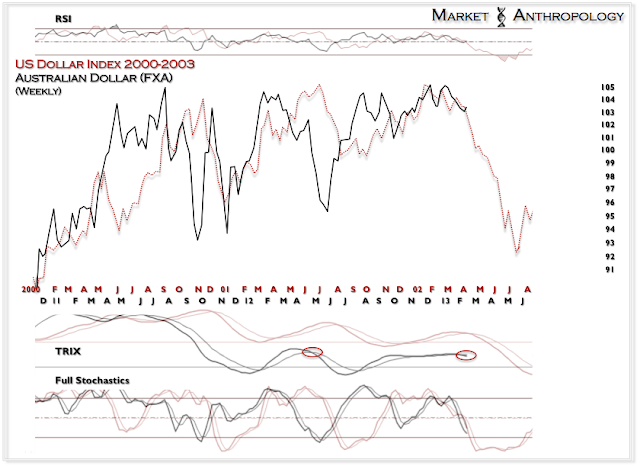 Since the euro peaked in July 2008, these diminished correlation extremes have marked exhaustion for the currency. 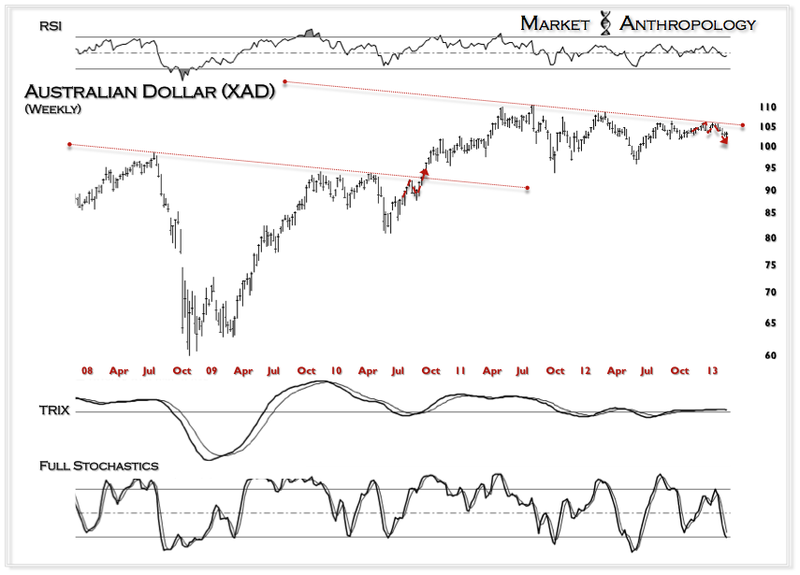 Although strongly selling off in the first half of the week, the Australian dollar closed marginally higher (+0.25%) with net speculative long positions continuing to recede over the previous week. We continue to maintain the opinion that the Aussie is carving out a long-term secular top. The Aussie comparative was slightly refitted to the price and momentum profile of the previous USDX top. 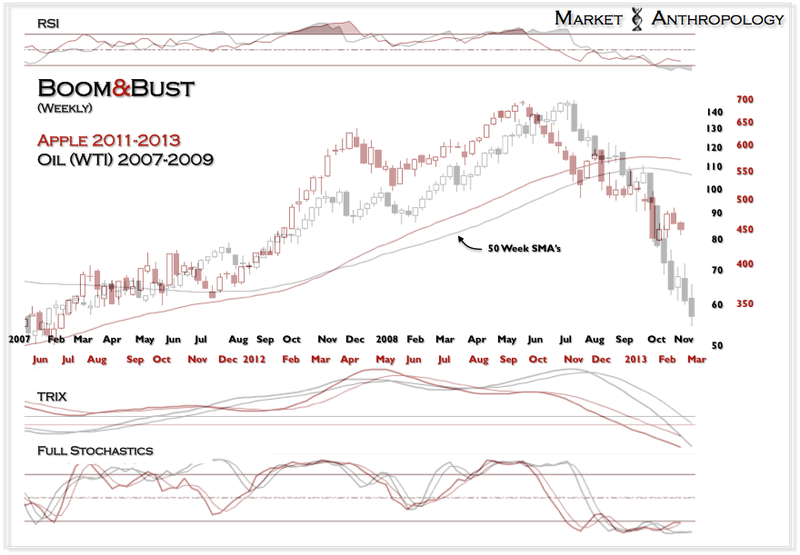 The RUT:SPX ratio had its largest weekly decline since the equity market lows in November. We continue to follow the aberrant positive relative strength divergence to the lower lows in the RUT:SPX ratio that is present again as it was during the last secular turn. 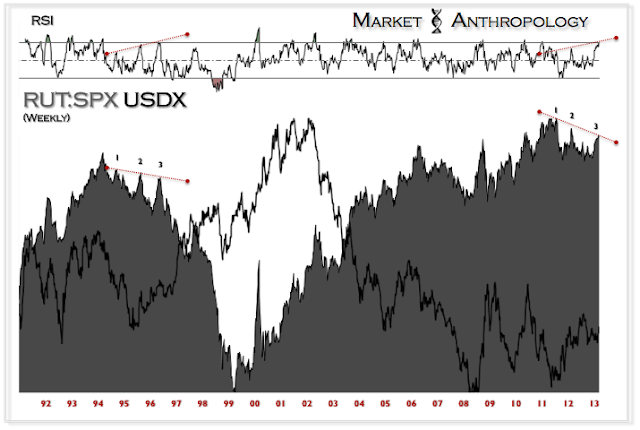 We also continue to follow the inverse correlation of the RUT:SPX ratio to the US dollar index that was present as well during the previous pivot. 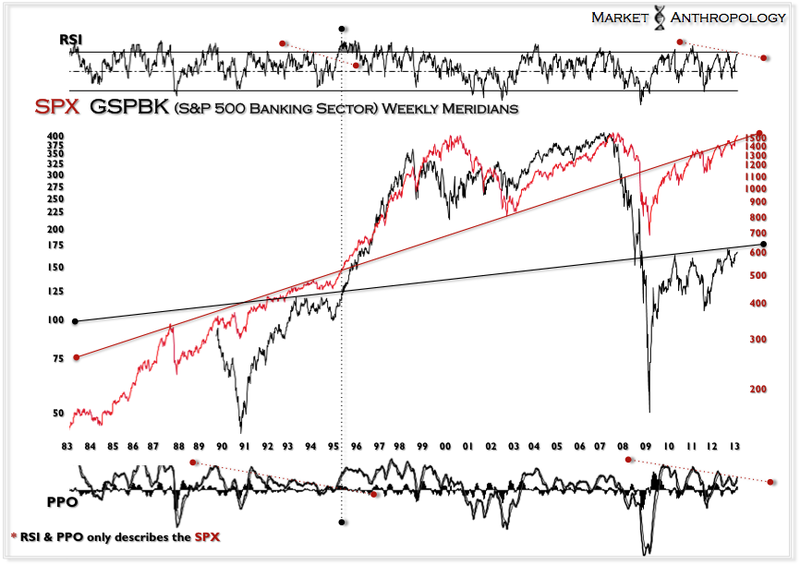 Considering the divergent resistance was again maintained in the RUT:SPX ratio, going forward, we once again expect small caps to underperform large cap stocks - likely on the downside. 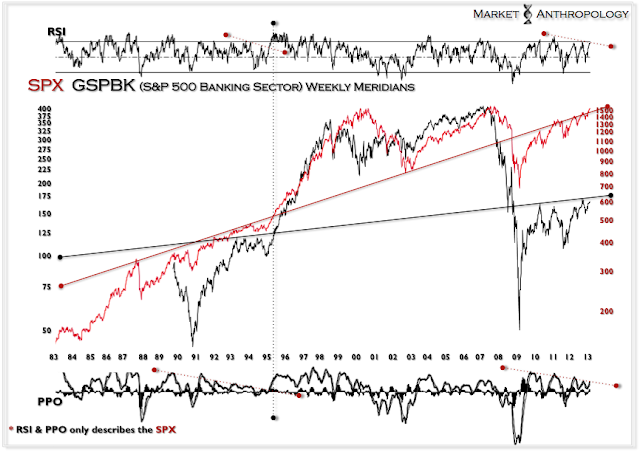 The SPX continues to be pressured by the overhead resistance of the long-term (monthly) meridian. 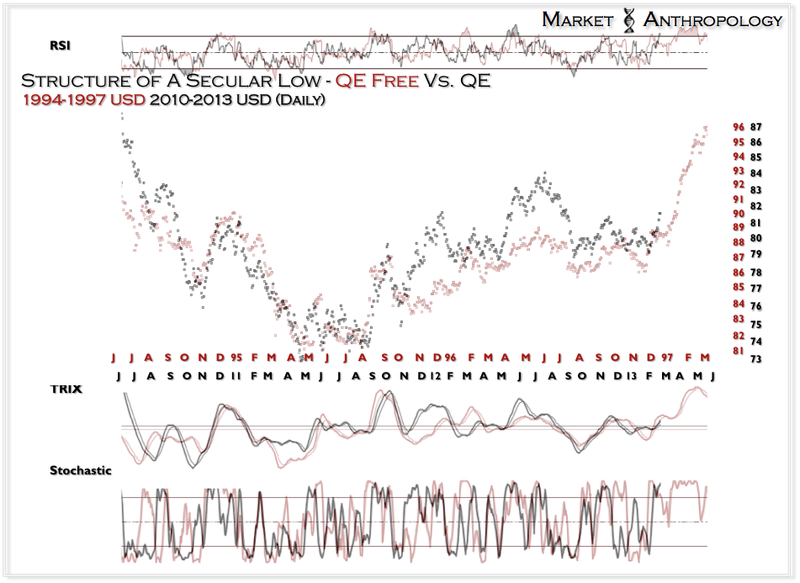 Since it broke through with Lehman Brothers in September 2008, the meridian has capped every subsequent advance. 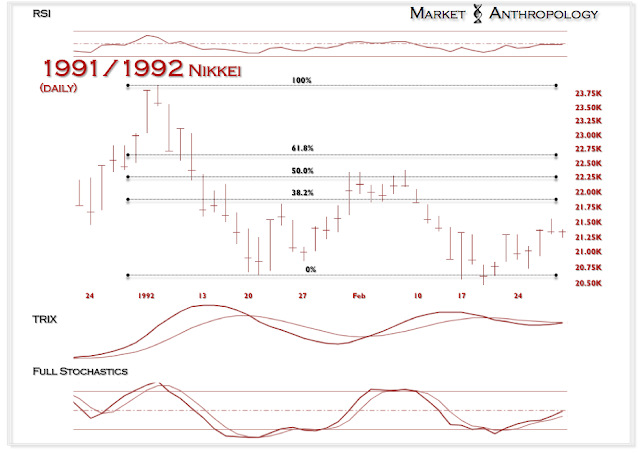 Although price appears to be on the cusp of a break through (circa May 1995) for February - momentum has stalled at resistance. Apple exhibited follow-through on the downside last week and continues to follow the powerful momentum unwind of oil - circa 2008. 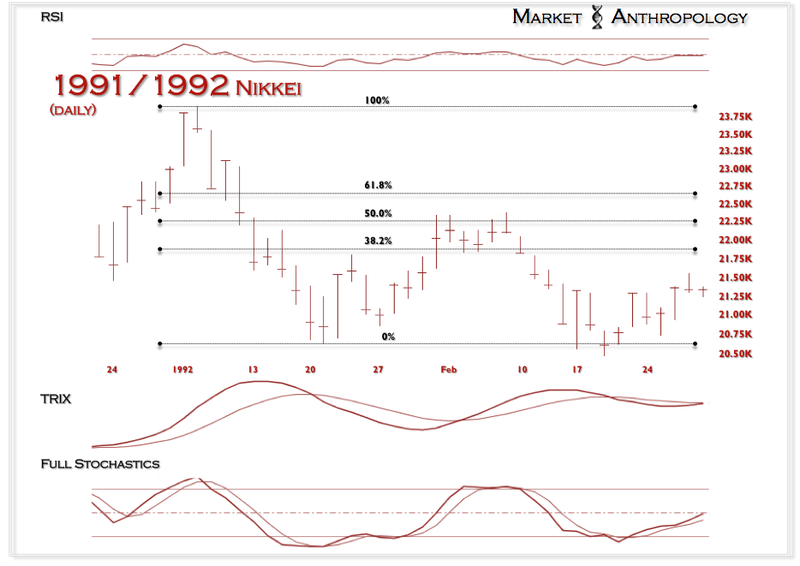 This has greatly limited the retracement rally in the NDX, compared to the new recovery highs displayed in the SPX and RUT. 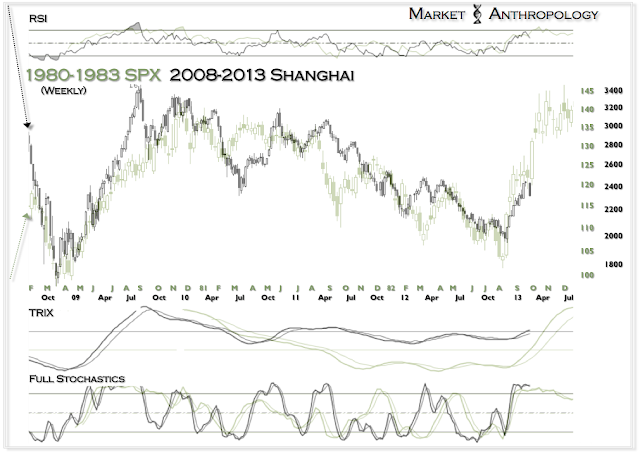 Both the Shanghai composite index and the CRB index were sharply lower (-4.86% and -1.65%, respectively) last week. 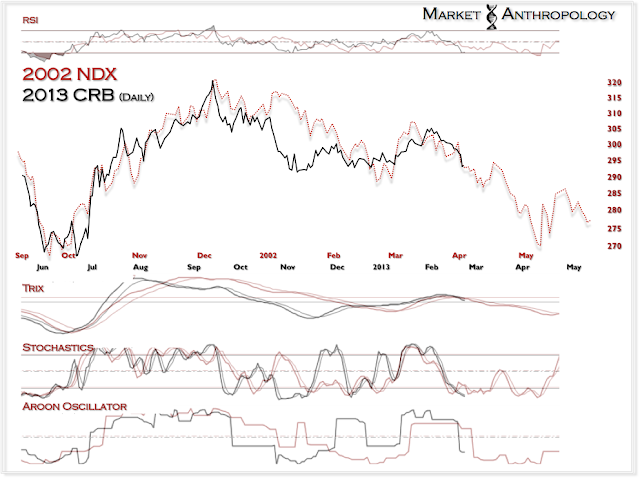 Considering our outlook on the US dollar, we continue to maintain that the CRB index will once again roll-over and break the lows from 2012. 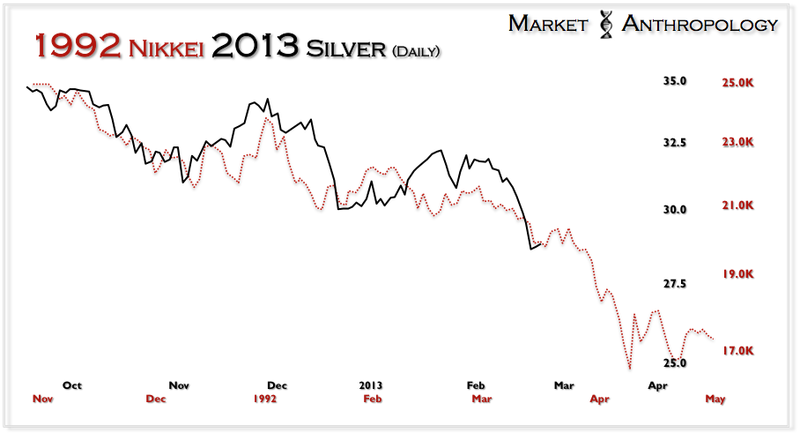 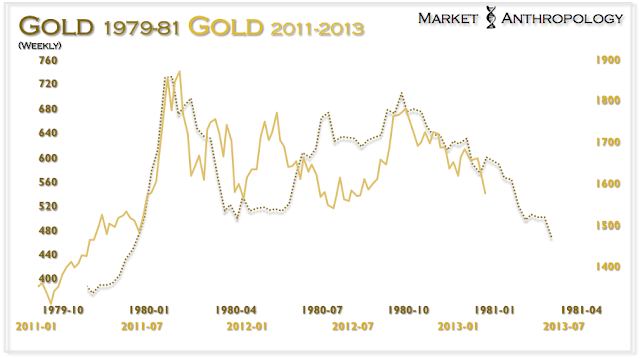 The precious metals miners continue to underperform - despite the pronounced weaknesses in spot prices. 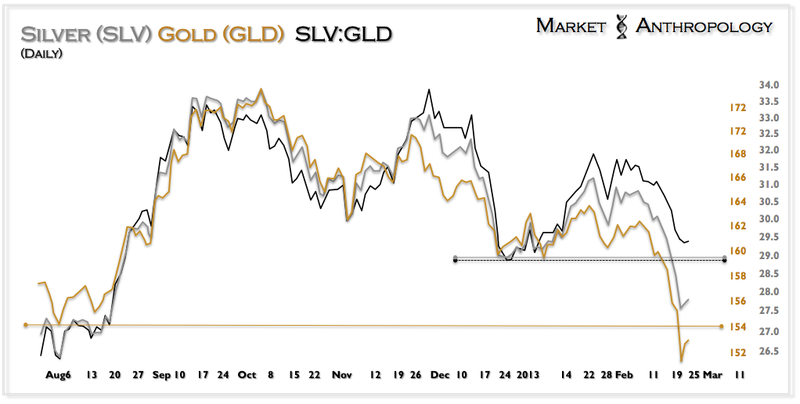 We maintain a bearish perspective on the miners, for the simple reason we believe weakness in the precious metals complex is ongoing.